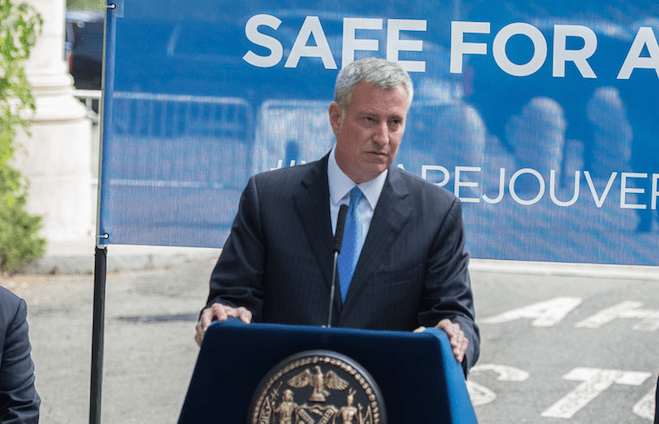 Mayor Bill de Blasio said at a press conference yesterday that pedestrian islands on Eastern Parkway were removed because unnamed elected officials wanted to make room for West Indian Day Parade floats, which would have otherwise posed a risk to the public. The mayor indicated the median islands would not have been installed had the city realized they would interfere with the parade, which is held once a year. The concrete islands at Eastern Parkway and Kingston and Brooklyn avenues were installed last December as part of a Safe Routes to School project 10 years in the making. The segment of Eastern Parkway where the islands were is a Vision Zero priority corridor with five priority intersections, including Kingston Avenue, where seven people were severely injured in traffic crashes from 2009 to 2013. Four pedestrians were killed on that section of the parkway during that time period. Last Sunday the Post reported the islands would be removed at the request of parade organizers. On Tuesday the city ripped them up. Yesterday the mayor’s office told Streetsblog removing the islands was “an NYPD directive.” NYPD referred us to DOT. Ultimately, though, it was the mayor who authorized removing pedestrian infrastructure from one of Brooklyn’s most dangerous streets with no public process. At Wednesday’s presser on new J’Ouvert security measures, de Blasio said he was prompted by requests from elected officials, whom he did not name. It definitely was a safety issue. In other words, the original pedestrian malls were put in for safety and then when the recognition of what it would mean to move the floats around them became clear, we realized there was an unintended consequence. So to me this is a case where the City was trying to do something good for the overall safety of the community, 365 days of the year. But on that one day there was a different problem that had been created that had not been fully taken into account — that the floats would have trouble navigating around them and that could create safety issues for the people around. So they are being taken out for the parade. We have to figure out a long-term solution. We don’t have that yet, but we will get to a long-term solution. I don’t know we can find out though. Some of the elected officials raised the concern that there might be a danger problem because of the floats having to navigate the very tight space. And when we looked at that very practically we came to the conclusion that they were right and we had to reset. So again, now we will have to figure out a solution that will work for the long-term. The idea of having that pedestrian island was a good one. We have to find that happy medium. The mayor’s office has not returned an inquiry into which elected officials made the request. We have a message in with City Council Member Laurie Cumbo, who represents the district where the islands were located. DOT did not provide a timetable for substitute traffic-calming treatments and did not specify what dangers the concrete islands posed one day a year that warranted their permanent removal. 1) Why couldn’t either one of the highly paid consultants who were undoubtedly involved with this project, or someone in charge of the parade, figure out there would be problems before the islands were installed? 2) Once it was apparent there were problems, why was the only solution to rip out something recently installed at great expense by the city? Why couldn’t the floats be modified, the parade rerouted, or even just have the offending floats removed from the parade? I don’t see why we should defer to something which happens once year when making decisions like this. This is a combination of sheer, gross incompetence combined with misplaced priorities in decision making. The floats already have to get past a spot with the same width in front of the Brooklyn Museum where there has been a ped island for a few years. As for the expense, I wonder if, in addition to the cost of removal, the City has to pay back the Safe Routes To Schools grant for a project that was not delivered. A few hours of safety for a parade float > 364 days of 24/7 pedestrian safety. What is the chance that someone or some group not connected to the parade (but connected to BdB) didn’t like the pedestrian islands and is using the parade for cover? Even as we speak, the reinvigorated Seniors for Safety and Neighbors for Better Bike Lanes are in a suite at Gibson Dunn organizing a plan for a mid-Summer parade on PPW, to be scheduled for a weekend they’re at their summer homes, of course. Precedent set, problem solved. BdB was kicking off Carnival early last night at Gracie Mansion. I skated by on the promenade on my way home from playing hockey and the grounds were filled with people drinking cocktails and someone was playing the pans with a decent sounding band. The better news from up north in Manhattan is that, even as the City is destroying hard won gains in Brooklyn, they’ve started pouring concrete for the pedestrian refuges along the triple digit stretches of Amsterdam Avenue’s bike lane. Above 106th,there’s been on-going, long-term utility on the opposite (east) side of the ave.that’s now wrapping up. Bulb outs in place, that street is now markedly improved from even six months ago. Everyone should have it so good, and better. My theory: They were driving their car and made a very wide turn at this intersection, hit the island (working as it was designed), and blew out a tire. Fuming they can’t whip through turns at 30 MPH, they called their buddy BdB. His words and actions openly contradict Vision Zero, which has become nothing more than a slogan. We need leadership that will actually commit to saving lives rather than being so hesitant to make improvements and so quick to undo them. As anyone knows who has crossed a wide street while turning vehicles whiz by on all sides, these kind of islands are an essential safety feature that cannot be casually tossed aside. There were community meetings ad nauseum before the islands were installed–where were the meetings about their removal? No highly paid consultants, just underpaid, over-worked, vastly under-supported (from the mayor’s office), and very capable city planners. Knowing what I know about those folks, they thought of this, but correctly chose to not allow a one day parade dictate safety for the community. So to accommodate an event that takes place for a few hours once a year, the street has to be more dangerous for all users (pedestrians, drivers, cyclists) the other 364.5 days of the year?!? Will the islands be put back in after the parade??? If being a safety hazard during the West Indian Day parade was the true reason for removal, then it would stand to reason that the islands could be put back for the other 364 days of the year when the islands are not a hazard and when they effectively increase street safety. Vision Zero: it’s all about Engineering, Education, and Enforcement – Except for on Eastern Parkway. Perhaps but they should have informed the city of any potential issues, assuming there were any. It may turn out the whole float issue is a smokescreen for something else. As someone already mentioned in this thread, perhaps someone with some favors to call in hit the islands while turning. The more I think about it, the more likely this sounds. As we install more of these types of treatments, either with or without bollards, I’ve little doubt cars hitting them will become more commonplace. We shouldn’t use that as an excuse to remove them. Indeed, the proper response from the Mayor to the errant driver would be that the infrastructure served its purpose. Better you hit something solid and destroy your vehicle than you run off the road and kill someone. The driver may see it differently, but too bad. That’s essentially what happened here in New Orleans when they ripped up the pedestrian refuges on North Peters Street in the Quarter. People kept running right over them and the papers made a big fuss like it was a dumb design. They replaced the raised sections with humps that I could easily drive over in my Miata. A ‘refuge’ denotes safety from danger…which begs the question why you would alter the design to make it EASIER for a distracted driver to hit a waiting pedestrian. Somewhere around 98% I’d wager…. The parade thing is so absurd that it’s clearly just an exuse. I hope one of us will attend the parade and document the safety issues that caused the ped island to be removed. We cannot sit idle while our hard earned right to safety is taken back by the city ..
We need an extreme reaction like a dye in where the island was…. It would seem that the West Indian Day Parade and its celebrations are themselves an annual safety hazard. The buck stops at the Mayor’s office. He’s guilty. You should contact the federal government administrators of the Safe Routes to Schools grants and inform them that they have a duty to get their money back. This will actually work. Federal departments *like* to get their money back, they can give it out to a different grant applicant. But the department in charge of Safe Routes to Schools probably doesn’t know about the scofflaw behavior of NYC. Once *notified* of the fact that NYC forfeited the funds, they will write a demand letter to get their money back.